Wendy Sherman is Under Secretary of State for Political Affairs. On September 16, she spoke at Georgetown University. “Its rich spiritual and ethnic traditions…” It’s Israel’s home and America’s Gulf partners. It’s “where values we cherish are under intense strain.” Washington “is alarmed and moved to act by the upheaval” roiling the region. America covets Middle East oil. It wants unchallenged regional control. It wants independent governments toppled. It wants pro-Western vassal states replacing them. It wants Israeli rivals removed. It wants democracy avoided at all costs. America’s cherished values include wealth, power and privilege alone. It doesn’t give a damn about “rich spiritual and ethnic traditions.” It never did. For sure not now. Sherman regurgitated Big Lies Obama repeated one after another in his September 10 address. Great powers honor their commitments and principles, she said. We’ll “move forward…to end conflicts,” she claimed. Longstanding US regional and global policies are polar opposite Sherman’s Big Lies. She repeated one after another. She sounds like her boss (John Kerry), Obama, and other top administration officials. Permanent war is official US policy. Escalating it is planned. ISIS “fighting has just begun,” it says. It’s gaining new recruits at a remarkable clip. They’re US shock troops against Assad. Its proxy army. Its dagger against legitimate Syrian governance. Its regime change plan. TheNational is an Abu Dhabi, UAE English languish daily broadsheet. Doing so can aid southern-based ISIS, Jabhat al-Nusra, Al Qaeda and likeminded groups advance north to Damascus. They could establish reliable supply routes. They’ll be able to aid other opposition groups on Damascus’ Southern and Western fronts. Seizing Damascus is key to toppling Assad. Opposition commanders say increased Southern Syria international support they’re getting is crucial in aiding their latest advances. Changes unfolded gradually since June. They’re coincidental with increasing ISIS, Jabhat al Nusra and Al Qaeda strength. Opposition groups believe things in southern areas are shifting their way. They’re “closer to the doorsteps of Damascus,” they say. Former Syrian Air Force Brig. General Assad Al Zaubi called captured Qunietra one of the most important victories since conflict began in the south. “It helps the rebels in southern Syria create a direct line to the south-western countryside of Damascus,” he said. They “now have more room for maneuver in southern Syria, while the regime’s presence and mobility has been seriously diminished,” he claims. Moon of Alabama (MoA) reported the above information. It did so two days earlier. It explained what should be widely reported. Jabhat al-Nusra and other anti-Syrian forces are trained and equipped at the Amman-based Arab/American Military Operations Command (MOC) center. US special forces and CIA operatives are heavily involved. So is Israel in supporting extremist anti-Assad rebel groups. Opposition groups moved into Quneitra governate. It’s in Southwest Syria. A partially executed spring 2013 plan began. It was later aborted. “Quneitra governate is a strip next to the Israel occupied Golan heights with a southern border to Jordan and a north western border with Lebanon,” said MoA. Anti-government forces cooperated against Assad. Seven rebel groups comprising the Islamic Front aided them. Washington backed them. So did Saudi Arabia. Qatar supplied $20 million. Combined forces infiltrated through Daara. They moved northwest along Israel’s border. The IDF supplied artillery support against Syrian units. It’s providing medical treatment for injured opposition fighters. UN authorities evacuated peacekeepers from “the Syrian side of the Golan Heights demarcation line,” said MoA. It runs “from Jordan along the Golan frontier up to Lebanon.” It may be used to launch attacks on Damascus from the south. It’s a short 40 miles away. Syria won’t easily contest these anti-government forces. Israeli “anti-air and artillery fire” support them. If Assad’s forces attack US warplanes entering Syrian airspace, it’ll be pretext for Obama to wage all-out war. He’ll claim just cause to do it. He’ll get away with it because who’ll stop him. He’ll ravage and destroy Syria more than already. He’ll go all-out to oust Assad. Israel partners with Washington to do it. It attacked Syria sporadically for years. It’s doing it again now. It actively aids opposition fighters. It protects them from Syrian government attacks. Its forces need to counterattack in Quneitra. If southern approaches to Damascus aren’t secured, Israeli-protected opposition forces could advance toward Damascus. Perhaps seize part of the city. Use it to launch more aggressive attacks. Seizing surrounding areas would be catastrophic. Losing Damascus would be worst of all. It would be game changing. It could turn Syrian victory into defeat. It could end up ousting Assad. It would mean replacing him with pro-Western stooge governance. It would eliminate another Israeli rival. It would isolate Iran. It would be disastrous for ordinary Syrians. It would give America another regional colony. It would advance it closer to total Middle East control. Hopefully it won’t happen. It’s vital to prevent it. The fullness of time alone will tell either way. On Wednesday, House Republicans and Democrats voted 273 – 156 to support anti-Assad groups. They did so without approving funding. They authorized Obama to arm and train rebel fighters. To accept foreign financing. 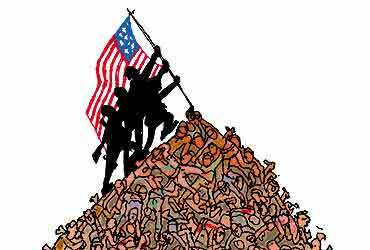 To wage war on Syria short of full authorization of force. She stopped short of expressing support for Obama’s planned bombing campaign. Failure to oppose it means backing what demands preventing. Rep. Barbara Lee (D. CA) expressed thoughts few House or Senate members explain. She called enacted legislation “more complex than just an up-or down vote on arming and training” anti-Assad forces. “The consequences of this vote, whether it’s written in the amendment or not, will be a further expansion of a war currently taking place and” Washington’s involvement in it. Congress moved one step closer toward approving Washington’s direct involvement in Obama’s three-and-a-half year proxy war. They did it despite bipartisan misgivings about chances for success. They’re concerned about another war dragging on for years. Amendment legislation was part of a short-term spending bill. It lets Washington operate through mid-December. On Thursday, Senate members are expected to approve similar legislation. Obama declared war on Syria. The Islamic State is the pretext. Syria is the target. Regime change is the objective. It’s replacing governance the vast majority of Syrians support. It’s replacing it with what they deplore. What they won’t tolerate. What they’ll contest to control their own lives, welfare and futures. They’re up for grabs. Obama’s war on humanity threatens them. They’re in the eye of the storm. Their survival depends on confronting Obama’s aggression. Stopping it matters most of all.